Snowden Nastiuk has gone to Russia after the time of the fall of Communism to bury himself, a loser in a loser nation in a world that wants only winners.Buried in a job working as a Document Controller in a Russian oil camp near Noyabrsk, Snow is – not happy, but at least content sitting out his life in a setting where he thinks he won’t have to feel any more pain. He has a job where he only has to interact with paper, not humans; a setting far from family and friends; and enough vodka to dull anything that threatens to get in past his defences.Until the woman walks into his life, literally. Magda Perskanski – physicist, gulag survivor, brothel madame, overseer of the Deficit Exchange Club, psychic capable of reading people’s pasts, mathabeautician – simply barges into his porta-cabin one day when Snow refuses to answer her knocking and kicks the legs out the crutches he’s come to depend on; she recognizes something deep inside the chuzhie that she knows is inside herself and refuses to let another human being suffer the same way as she has done.Little by little, Magda draws Snow out, first the story of what has caused him so much pain – the suicide of his mother when he was a young boy and the mindless death of his young girlfriend by a falling tree in the forest on a camping trip – then out of his torpor and the start of his first tentative steps back into the landmine-filled world of personal relationships. Not only is there Magda, there is Kolya, the unrepentant Communist who works with Snow in Document Control. 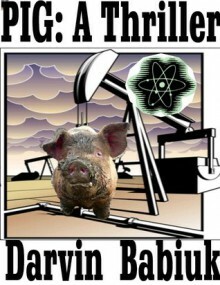 And there is Pig –Porfiry Makahonic – the camp boss who rules everything in “his” oil camp with an iron fist, including his pet Doctor.There is also the mysterious sickness that keeps affecting and even killing the labourers in the oil camp’s pipeline/pigging system and laboratory, something which concerns Magda deeply, but which Snow doesn’t care about until Kolya ends up dead protecting the integrity of “his” documents against the crimes going on in camp.Crawling out of his vodka bottle long enough to go digging inside the day-to-day documents of the oil camp, Snow and Magda find evidence that Pig and the Doctor are hijacking radioactive cesium used in oil well-bore reading equipment and medical instruments and smuggling it out of the camp through the pig in the pipeline to terrorists who plan to use it in dirty bombs in Manhattan, Manchester and Mumbai.Before they can get the information to the authorities – no one is sure whom to trust in a still-reeling Russia run by the siloviki and absent rule of law – Snow is found half-frozen outside of his cabin on a cold winter’s night. Did somebody try and kill him or did he decide to follow his mother and ex-lover into death? In the end, Magda manages to bring Pig to justice and guide Snow back to a life he deserved all along.